Source: 2and2/Google, “The Values of YouTube” Study, Oct. 2017 (n of 1,006 consumers between the ages of 18-54, with 918 monthly YouTube users). Respondents were asked to choose which platforms they turn to for a range of needs. Here are a few things we learned from this research, along with some strategies for brands looking to incorporate the lessons into their 2018 planning. Source: 2and2/Google, “The Values of YouTube” Study, Oct. 2017 (n of 1,006 consumers between the ages of 18-54, with 918 monthly YouTube users). As well as asking people why they head to YouTube, we also wanted to know what feelings the content triggered. 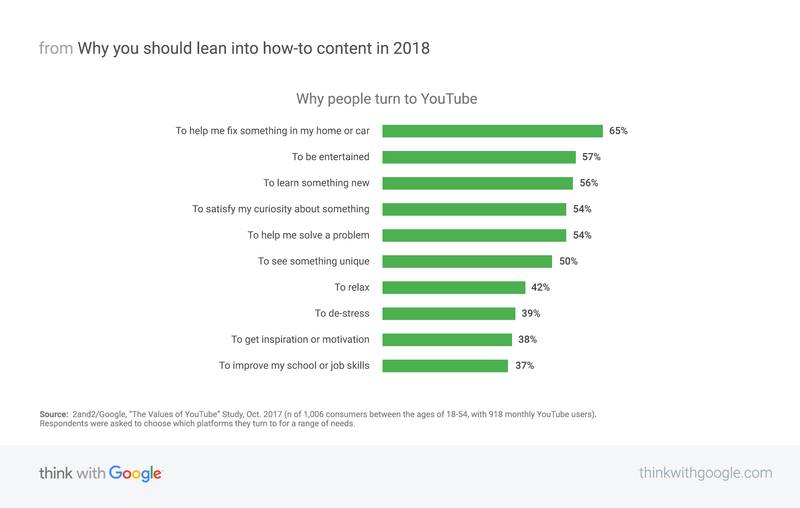 Given the popularity of how-to and learning content, we weren’t surprised when the results came in. 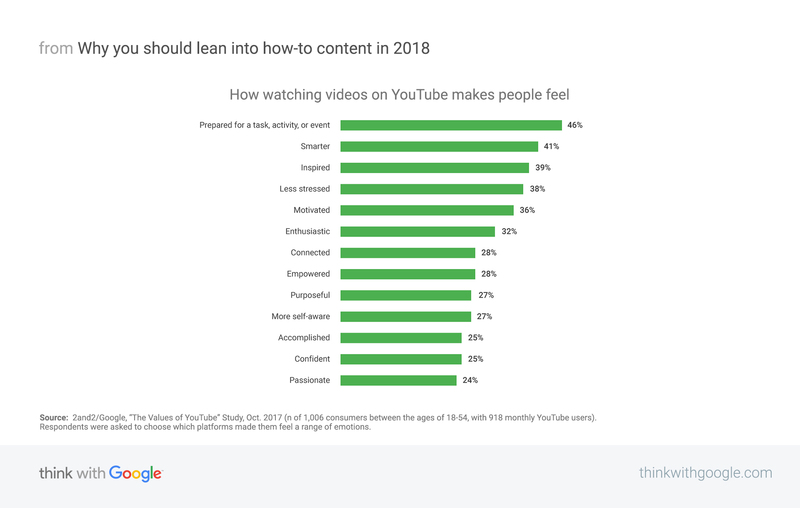 People spoke most frequently of feeling “prepared”, “smarter” and “inspired” after watching videos on YouTube. Source: 2and2/Google, “The Values of YouTube” Study, Oct. 2017 (n of 1,006 consumers between the ages of 18-54, with 918 monthly YouTube users). Respondents were asked to choose which platforms made them feel a range of emotions. It’s easy to wave off how-to and learning content as a tricky fit for your brand. So how can brands nail this form of content? Make Up For Ever offers some very interesting lessons. Marketers at the cosmetic brand had been observing the popularity of how-to videos. They’d also heard from women of colour how underserved they felt by the beauty industry. Armed with those insights, they created a how-to driven ad campaign with videos like “How to Highlight and Contour for Black Women”, which they served before relevant how-to makeup tutorials. Rather than creating ads that interrupted makeup enthusiasts’ learning experiences, the brand seamlessly immersed itself and its products into them. Make Up For Ever Ultra HD, the product used in the tutorial, saw an overall lift in brand recall of 44% and an 18% lift in organic product-related searches. The brand also increased its YouTube subscriber count by 11% in a single month. The lesson for marketers? When you prioritise how-to content as much as your consumers do, the results speak for themselves. 1,2,3 2and2/Google, “The Values of YouTube Study,” U.S., Oct. 2017 (n of 1,006 consumers between the ages of 18-54, with 918 monthly YouTube users). 4 Google/Ipsos, Video Mobile Diary, U.S., 2017 (n of 18,219 total video occasions).